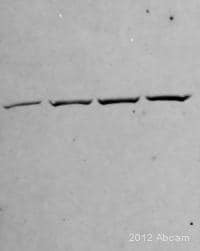 Mouse monoclonal gamma Tubulin antibody [GTU-88]. 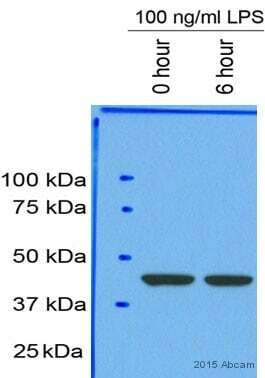 Validated in WB, ELISA, IHC, ICC, ICC/IF and tested in Mouse, Rat, Chicken, Hamster, Cow, Dog, Human, Xenopus laevis, Indian muntjac. Synthetic peptide conjugated to KLH, corresponding to N-terminal amino acids 38-53 of gamma Tubulin. This product was changed from ascites to tissue culture supernatant on 18th October 2016. The following lots are from ascites and are still in stock as of 18th October 2016 (GR286332 and GR225007). Lot numbers higher than GR286332 will be from tissue culture supernatant. Please note that dilutions may need to be adjusted accordingly. Our Abpromise guarantee covers the use of ab11316 in the following tested applications. WB 1/10000. 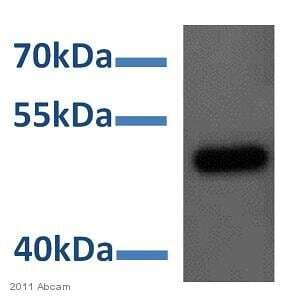 Detects a band of approximately 48 kDa (predicted molecular weight: 48 kDa). 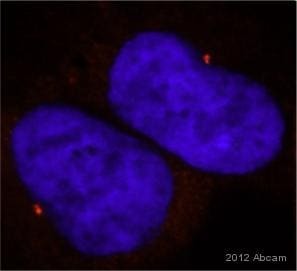 ab11316 at a 1/200 dilution staining HeLa cells by Immunocytochemistry. 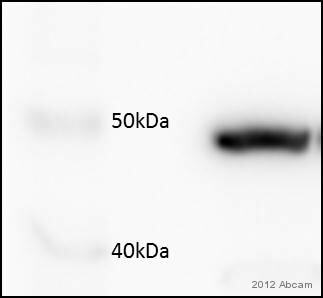 The antibody was incubated with the cells for 30 minutes and then detected using a Cy3 conjugated Goat anti-Mouse (H+L) (green stain). 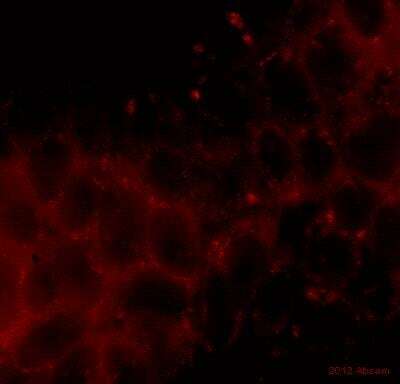 The antibody recognizes gamma-tubulin located at the centrosomes in metaphase and also faintly recognizes the centrosome association during interphase. This image is courtesy of an Abreview submitted by Kirk McManus on 2 December 2005. 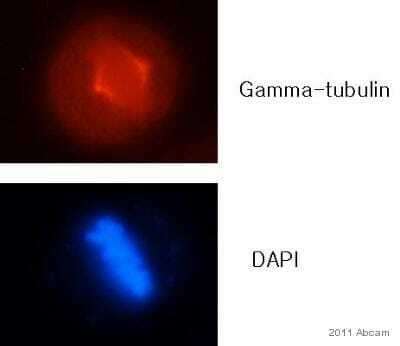 Immunocytochemistry/Immunofluorescence analysis of HeLa cells labelling gamma Tubulin using ab11316 at a dilution of 1/5000. Cells were permeabilized with methanol and folowed by fixation with acetone. 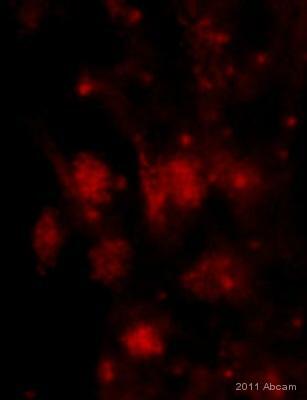 A Cy3-conjugated goat anti-mouse IgG was used as the secondary antibody. Publishing research using ab11316? Please let us know so that we can cite the reference in this datasheet.